The Dutch tulip mania (seventeenth century) is generally considered the first recorded speculative bubble. As the name suggests during the tulip mania the prices of tulips soured to unrealistic heights. The exact start of the mania is difficult to determine. The tulip was introduced to the Netherlands in 1593 by the Flemish botanist Charles de l'Écluse, who received them from a Turkish ambassador. After the introduction its popularity started to grow. In 1623 the price of a popular variety tulip was already a thousand guilders. The average annual wage in that period was a hundred and fifty guilders. At its peak, prices of six thousand were recorded. The endpoint of the mania is very clear. In February 1637 the prices collapsed dramatically. Leaving many traders broke. 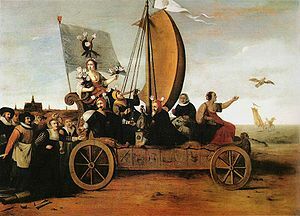 The mania occurred in the Dutch golden age. During this period the Dutch were dominant in the world. Specifically in the fields of its military fleet, trade, art and science. Furthermore the mania developed during the height of a bubonic plague epidemic. The latter could have impacted behaviour in two ways. First, the luring danger of death could have increased investors risk appetite. Second, the death of people causes the accumulation of wealth with a smaller population (people inherited money). Both aspects (the golden age and the plague) led to an increase in the wealth of people. As the tulip price started to rise after its introduction, more and more of this wealth was directed towards the tulip market. This increased the profits on tulip investments, which again stimulated investors to invest more of their money in tulips. As more and more people invested in tulips and started growing bulbs, the market grew and developed. This led to the introduction of financial instruments comparable to modern financial markets. A vivid trade in future contracts developed. Buyers agreed to buy bulbs in the future, which had not even been planted yet. Traders also started to short sell bulbs. This means that they sold bulbs which they did not own. They assumed that they could buy them by the time they had to deliver them. The view developed that money from around the world would continue to flow towards the Netherlands, to buy tulip bulbs. Nearing the end of the tulip mania, high value trades were being made using complex contractual obligations. The legal enforceability (and thus value) of these contracts fluctuated as laws were changed. This led to a complex and volatile market. In February 1936 investors suddenly and collectively lost their faith in the market. The price was no longer considered realistic. As the price increase stopped, investors panicked and began to sell in unison. The desire to buy a bulb had just evaporated and with it the value of a bulb. The impact of the mania has been contested in recent years. The most popular source (“Extraordinary Popular Delusions and the Madness of Crowds”, by Charles Mackay.) on the mania is now considered biased by anti-speculative pamphlets (with a religious background), which were used as a source. Nonetheless the dramatic increase and drop in the value of tulips remains uncontested.